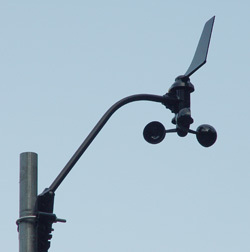 The station’s data are collected by a Davis Vantage Pro2 Professional Weather Station. There is a thermometer, anemometer, automatic rain gauge, humidity sensor, and barometer. 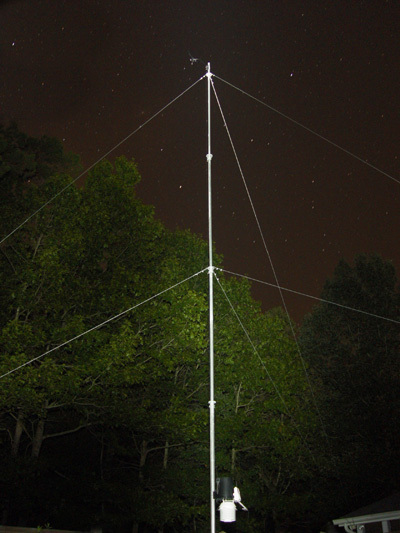 The sensors for this station are situated as optimally as possible for the highest accuracy with the temperature-humidity sensor 5 feet above the ground and the anemometer approximately 34 feet above the ground in a relatively clear area. Data from this station are transmitted wirelessly to a dedicated weather computer every 3 seconds. This computer then uploads that data to charlotteastronomers.org/weather with the current conditions updating every 10 seconds. Data quality is constantly monitored via the Citizen Weather Observer Program (CWOP). 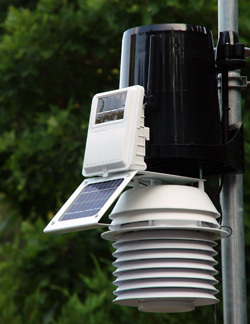 The solar-powered weather station is fully automated and operates 24 hours a day every day.